Summary: Learn how to do different paint effects, apply glaze, apply ragging technique, apply rag-rolling technique, apply sponging technique, apply stippling technique, apply dragging technique, apply graining technique, apply distressing technique, apply colourwash technique and use a stencil on a wall. There are a number of paint effects that can transform a bland wall - trompe l’oeil (trick of the eye) effects create the illusion of depth or imitate the surface of other materials such as stone, wood or marble, and distressing woodwork can transform an ordinary piece of furniture by creating an antique or a rustic look. Usually a translucent glaze (also known as scumble glaze) is used as the topcoat to create textured effects, but for a more dramatic look, apply the effect directly onto emulsion. If this is your first attempt at creating a paint effect, first practice on a small section of wall. You will have to work quickly to apply the desired effect before the glaze dries. Working in sections, apply an even layer of glaze to the wall with a paintbrush, softening any harsh brushstrokes with a softening brush. 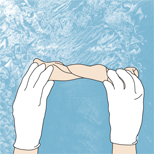 As the name suggests, this is a technique where a crumpled rag is dragged over the glazed surface. The effect is rather like the texture of crushed velvet. Keep the rag as dry as possible, replacing it if necessary. For a bolder effect, try using a different material or experiment with varied sweeping motions. Roll up a twisted rag and drag it down the wall to create an effect that looks like creased fabric. Change rags whenever it becomes saturated. 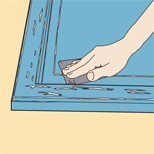 Sponging is an excellent technique for getting into corners and other awkward areas with minimal difficulty. 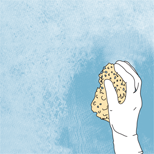 Use natural sponge for a rustic look or synthetic sponge cut to an irregular shape for a finer covering. For a speckled finish sweep a damp sponge over glaze, dabbing lightly or hard depending on how subtle you want the effect to be. Avoid too regular a pattern by dabbing randomly. To sponge a colour onto pale walls, soak up a little paint with a dry sponge and dab randomly on the walls. Start with a sparse layer of sponged paint and increase the vibrancy of the colour by adding more layers. This is an easy way to eliminate brush marks or roller tracks on a painted wall. A stippling brush dabbed over glaze can produce a subtle textured finish. 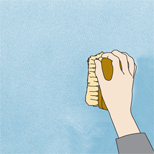 Instead of dragging the brush, touch the wall with the tips of the bristles. Stippling pigmented glaze over a wall can provide blended colour variation. This is one of the simplest techniques to follow. 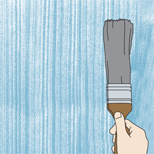 All you need to do is drag the tip of a dry paintbrush down the glazed wall in vertical or horizontal stripes. For lighter stripes, reduce the angle between the brush and the wall. 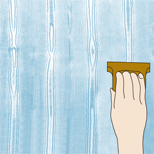 This is a useful method for using on doors to suggest a wood grain effect. To create a wood effect on a surface made from wooden boards, you will need a graining tool. Having stained and finished the wood as desired, glaze the surface and drag the tool along the surface, rocking the tool backwards and forwards. Each time you rock the tool, a knot will appear in the grain so, to avoid a uniform pattern, vary the degree of rocking to create an authentic finish. 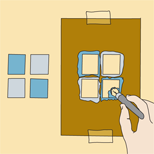 Wipe the tool regularly to prevent glaze clogging up and smearing the surface. If you make a mistake just brush out the pattern and try again. To prevent paint bonding evenly on a surface, apply Petroleum jelly in patches beforehand. Alternatively, sand off paint from around moulding to give an ageing effect. 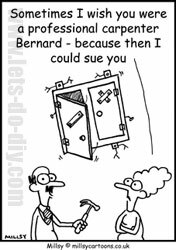 Using a small hammer, paint can be chipped away or the surface can be dented for an authentic look. To imitate the craquelure effect - a tracery of fine cracks - found on antique furniture or cornices, use crackle glaze. To make crackle glaze, apply a layer of oil-based varnish followed by a layer of water-based varnish when varnish is still tacky. As the varnish dries, cracks will appear. Rub some oil into the cracks and re-varnish the surface after a week or so. A colourwash can create a soft, faded country look or be used to disguise uneven walls. For a subtle effect apply a thin layer of colourwash over a pale background with a brush. To blend the brush strokes, drag a piece of cheesecloth over the surface. You can buy colourwash ready-mixed in the form of pigmented glaze or mix up your own to a specific tone by adding paint to glaze. If your glaze is water-based, add acrylic paint to the solution, and use oil paint with oil-based glazes. Stencils can be repeated to create a boarder frieze around a room or used instead of wallpaper. They are an effective means of brightening up children's rooms or can be used with glaze instead of paint for a faintly patterned look. You don't even need to buy a stencilling kit - just cut out your chosen shape from a piece of card and stick it to the wall with masking tape.